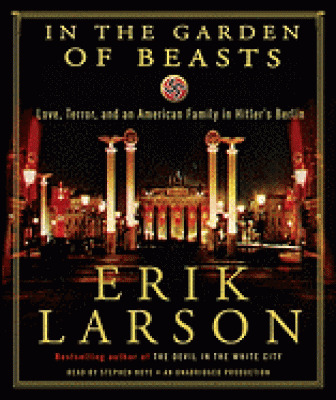 Erik Larson has been widely acclaimed as a master of narrative non-fiction, and in his new book, the bestselling author of Devil in the White City turns his hand to a remarkable story set during Hitler's rise to power. The time is 1933, the place, Berlin, when William E. Dodd becomes America's first ambassador to Hitler's Germany in a year that proved to be a turning point in history. A mild-mannered professor from Chicago, Dodd brings along his wife, son, and flamboyant daughter, Martha. At first Martha is entranced by the parties and pomp, and the handsome young men of the Third Reich with their infectious enthusiasm for restoring Germany to a position of world prominence. Enamored of the New Germany, she has one affair after another, including with the suprisingly honorable first chief of the Gestapo, Rudolf Diels. But as evidence of Jewish persecution mounts, confirmed by chilling first-person testimony, her father telegraphs his concerns to a largely indifferent State Department back home. Dodd watches with alarm as Jews are attacked, the press is censored, and drafts of frightening new laws begin to circulate. As that first year unfolds and the shadows deepen, the Dodds experience days full of excitement, intrigue, romance and ultimately, horror, when a climactic spasm of violence and murder reveals Hitler's true character and ruthless ambition. Suffused with the tense atmosphere of the period, and with unforgettable portraits of the bizarre Goring and the expectedly charming--yet wholly sinister--Goebbels, In the Garden of Beasts lends a stunning, eyewitness perspective on events as they unfold in real time, revealing an era of surprising nuance and complexity. The result is a dazzling, addictively readable work that speaks volumes about why the world did not recognize the grave threat posed by Hitler until Berlin, and Europe, were awash in blood and terror. ERIK LARSON is the author of the national bestsellers Thunderstruck, The Devil in the White City, and Isaac's Storm. ErikLarsonBooks.com From the Hardcover edition.